Update: I edited this page to remove specific brand names because the CEO of one of the manufacturers mentioned as being cheap called me and informed me that his locks are in fact manufactured in the USA and that his company’s lock probably broke because it was installed wrong. I have reservations about why his lock broke but am giving him the benefit of a doubt. Lots of my customers balk at the cost of a commercial leverset because they see doorknobs at the hardware store for under $50. The least expensive commercial passage leverset I feel comfortable guaranteeing is $82 retail. My Marks Survival Series leversets retail for over $500 (though I don’t think anyone actually pays that much in practice). Some leversets I don’t want to deal with can be had for much less, and the reason I don’t sell them is that they have a tendency to fail. If people don’t notice that the lock has failed and shut the door, they will either be locked out or even worse locked in as was the case for my unfortunate client today. The reason they got locked in their office was because the builder installed leversets that were bottom dollar and one of them failed. Import Chinese locks have a tendency to fail prematurely and for no good reason. The leverset failed because it is made of cheap metal that snapped at the junction between the lockset and the latch, a part called a retractor. Usually the latch fails in cheap locks, but this lock is cheaper than usual apparently. If a lock isn’t installed properly even a well-constructed lock will probably fail over time, so make sure to read the installation instructions or hire somebody who knows what they are doing. So take advantage of the lesson these poor folks learned the hard way: get reasonable hardware in the first place or you may end up paying me to come out and open your door and then replace it with a decent lock you should have had on the door in the first place. A good way to find a decent lock is to see if the lock advertises a guarantee. On the top is a good lock. 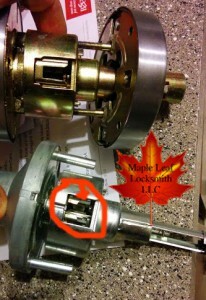 On the bottom is a poorly made lock where the part that grabs the latch has snapped on both sides (circled). Previous Previous post: Do Not Duplicate: Who Will Copy This Key For You?